S.M. 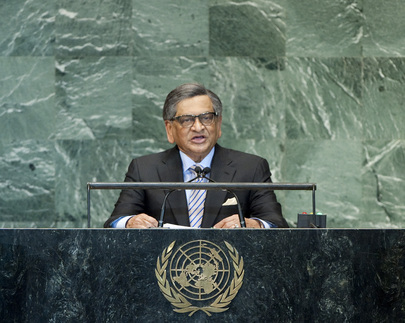 KRISHNA, Minister for External Affairs of India, said developing countries were still recovering from the global economic downturn, with their quest for poverty eradication and sustainable development an uphill task. Despite such challenges, India was committed to addressing climate change through a comprehensive, equitable and balanced outcome based on the principles of equity and common but differentiated responsibilities. India would host the Eleventh Conference of Parties of the Convention on Biological Diversity in two weeks, and sought support for an outcome harmonizing strong action on biodiversity with basic development objectives. He went on to say that, in outlining the Sustainable Development Goals, the Millennium Development Goals (MDGs) must be integrated into the new framework. In the post-2015 development agenda debate, the focus must be on the word “development”. Discussion must be entrenched in the principles of the United Nations Conference on Sustainable Development, and the intergovernmental process at the United Nations. Poverty, employment and food and energy were just some of the challenges that must be given priority. Attention was also needed on ensuring gender equality and upgrading young people’s skills for future employment. He went on to note that India’s multi-religious, multi-ethnic and multilingual society was underpinned by peaceful coexistence and tolerance, values that Mahatma Gandhi placed at the core of national life. “Violence cannot lead to greater understanding”, he said, urging full respect for the safety and security of diplomatic personnel, and a “zero tolerance” approach to terrorism. It was high time to see the political will needed for a Comprehensive Convention on International Terrorism, and international action, under United Nations auspices, to address the welfare of seafarers amid the menace of piracy. Turning to peacekeeping, he said India had taken part in 43 United Nations peacekeeping operations since the 1950s, underscoring that the challenge was to ensure adequate resourcing for such missions, including in post-conflict and peacebuilding contexts. As such, he voiced hope that progress would be made on all outstanding issues between Sudan and South Sudan. There also was a need for renewed consensus on non-proliferation and nuclear disarmament, as well as for meaningful dialogue among all nuclear weapon States to build confidence, and reduce the “salience” of such weapons in security doctrines. Measures must be taken to reduce nuclear risks, including those posed by terrorists’ acquisition of weapons of mass destruction. The Conference on Disarmament deserved support in discharging its mandate. On other matters, he urged all parties in Syria to recommit to resolving the crisis through an inclusive, Syrian-led political process. India supported the Palestinians’ aspiration for enhanced United Nations status, underlining the imperative for an independent Palestine, with East Jerusalem as its capital, living alongside a secure Israel. In South Asia, India had embarked on resumed dialogue with Pakistan, advocating a step-by-step approach to normalizing bilateral relations. India’s position on Jammu and Kashmir was well-known: the area was an “integral part of India” and the people there had chosen and reaffirmed their destiny repeatedly through India’s well-established democratic processes. His Government was also ready to partner with the Afghan people as they rebuilt their country. Terrorist safe havens beyond Afghanistan’s borders hampered peace and security in that country. Finally, he urged an expanded Security Council in both permanent and non-permanent categories, stressing the need to address the lack of permanent membership for Africa. India also would support developing countries’ participation in world economic and financial institutions. The representative of India, responding to references by his Pakistani counterpart, said Jammu and Kashmir State was an integral part of India, adding that Pakistan’s illegal occupation of parts of the region was in violation of India’s territorial integrity and international law. India rejected Pakistan’s claim in its entirety. The representative of India, rejecting the comments by his counterpart from Pakistan, reiterated that Jammu and Kashmir was an integral part of India.